We've all seen people asking, here and elsewhere, where one can find reliable USB-C to Lightning connectors. Alas, Apple still does not allow third-parties to produce them. There have been news, though, that the licence is coming. We've also longed for the moment when Apple, and other high-profile manufactures, would fully embrace USB-C in all it's devices - to this day, there are not that many devices, specially outside the high-end devices. For a standard that's around for a while now, and that offers so much benefit over the previous - and still used - version, it's taking a while to get broadly adopted. And now, to add fuel to the rumor mill, there are reports that the next iPads will drop the lightning port in favour of USB-C. It kind of makes sense, from a progressive adoption standpoint. First Apple releases a notebook with the port, then licences for USB-C to Lightning for third-part manufacturers, then introduces the port in a major device - but not the company's main device. Maybe they'll throw an adapter in the box, for good measure. Maybe, 2019's iPhones will drop Lightning in favour of USB-C - let's just hope another new, better standard is not already upon us by then. MacWorld argues both in favour and against the move in this article. What do you think are the chances Apple introduces USB-C in the next iPads? It would be nice, but I don’t think they will just to keep them a micron thinner. I disagree about Apple adopting USB-C for any iDevices. The Lightning connector/port is smaller/thinner...not by much but I seriously doubt that Apple would adopt a hardware format that wouldn't let them keep their devices as thin (or thinner) than they are now. I think they'd rather ditch the port altogether than having to resort to making the device thicker just to use a different port. Either that or create another proprietary connector, even smaller/thinner than Lightning. They'd also have to sell the idea to the millions of iDevice users, basically saying/admitting that Lightning is now somehow inferior to the USB-C format. I just don't see that happening. You make some great points! Personally, I feel as though Apple will not be switching to USB-C with this year’s iPads, but rather just be including a USB-C to Lightning cable (along with a USB-C power adapter) in the box.... We should find out come late-October! It would be nice for them to change. But that would take away an income stream from them. I doubt they will make a change at this time. But that would take away an income stream from them. You know what would be nice? Advancements in the tech that doesn't change the form-factor, like Ethernet cables and HDMI. USB-A had to be replaced as devices got thinner. Micro-USB is not reversible. 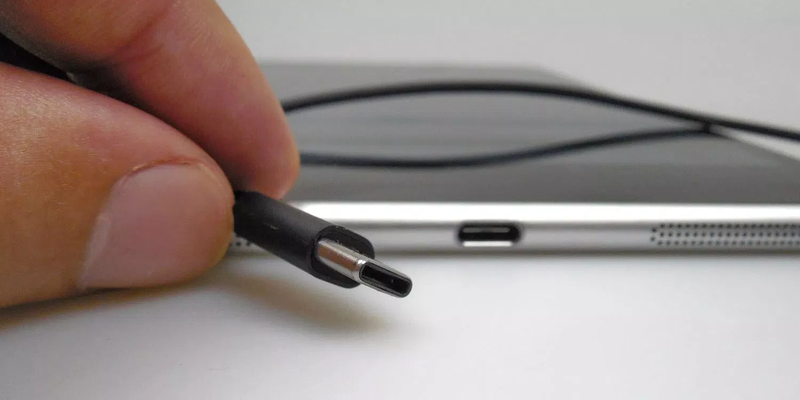 Both Lightning and USB-C have a slim enough form-factor to allow for many years of use. I personally don't think we need thinner devices - at some point, either battery life will be abysmal or the device will be too fragile. HDMI retains the same form-factor but advances power and data throughput. Why not just do the same with either USB-C and/or Lightning from now on? Let's just keep it until the need for cables dies altogether. At some point there is to thin. I don't how strong its made it will bend or break. I think the current thinness of the iPhones and some of the new flagship android devices is then enough. Everything should move to USB-C. Its just a more useful system. It's about time. We should have a worldwide standard and USB-C is it. It's fast and universal. Yeah, it's a whole new day! Mod edit to remove potential spam content / malware link.